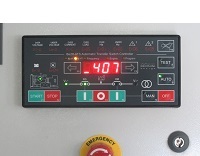 The Be242 is 3-phase ATS controller. All parameters, measurements, events and instruments are captured via bluetooth-compatile sensors. The ATS controller features accurate measurements for Vac, Aac, Vdc, Hz and Battery Vdc on display. When closing to the panel, you can download LOG EVENTS having an overview of the system. The Be242 features MODBUS via RS485 and complies with NFPA-110 / NFPA-99. By using our TCP-IP server you can monitor and control the Be242 via INTERNET. Using bluetooth devices you can save as much as 50 meters f cables and several hours of workmanship. Push the [MAN] push button to select the MANUAL mode. Push the [START] push button: the Be28 maintains the command to start the engine to controller of the engine for one minute. If the engine fails to start you can try to start again. When the green LED generator presence will turn on, push the [I] (KG) push button to close the generator circuit breaker. The alarms of Under/Over voltage and frequency are enabled if the Be28 works according to NFPA-110 (parameter P23=ON as described in the OEM user manual). 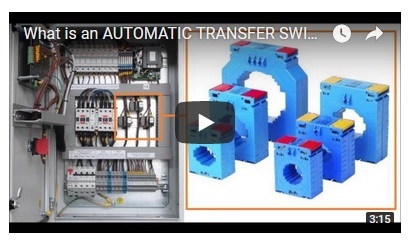 To transfer the load to the Mains, push the [I] (KM) push button; the [KG] will open immediately and after a 2 seconds the Mains circuit breaker will close. To open a circuit breaker, push the [O] push button. When the engine is running, the green LED turns on. To stop the engine, push the [STOP] push button until the [StOP] message appears on the display. If the engine has already stopped, it is possible to reset the STOP sequence by pressing the [STOP] push button. Push the [AUTO] push button until the green LED will illuminate. The message [Auto] will appear for a second on display. The engine starts when the Be28 detects a Mains failure. 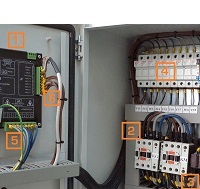 The Mains circuit breaker (KM) opens after the [P.0] timing. Then the timer [P.01] takes place to delay the start of the engine. Once started, after the warm-up ([P23]) time (Voltage and Frequency must be within the settings), the GENERATOR circuit breaker (KG) will close. If the Mains restores, after the [P.02] the KG will open. The KM will close after a programmable changeover timing ([P.3]). The Engine will stop after a cooling down time ([P24]). 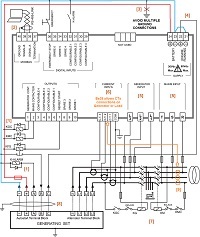 If the engine shuts down, the KM closes independently of the Mains status if the [P.23] is [ON] (NFPA-110 mode; see the OEM user manual), otherwise the KM will close only if the Mains is within the programmed settings. In AUTO mode, the Be28 can start and stop the engine according to programmed inputs (see Table 7.06 and 7.07 of the OEM user manual). Note: the BE28 turns on the alarm [Er.11] (Fail to start) if the engine does not start within 8 minutes after the engine start request. Push the [TEST] push button until the green LED illuminates; the display will indicate the message [Test] for a second. The Be28 starts the engine and transfers the load to the generator if the [P.17] is [on]. To stop the engine, select the AUTO mode (if the Mains is present) or select the OFF mode. If you push the [STOP] push button when the Be28 is in AUTO or TEST, the [Er.09] will energise. To clear the alarm, select the OFF mode (see also section 8.0 of the AMF controller user manual). Use [←F8] and [F9→] to select a menu. Use [ACK-F10] (see the layout in section 1.0) to display the name of the parameter. The OFF mode shuts down the display and turns on the dot on the right side of it. Push a button to turn on the panel. The following table lists the functions of the display. (0 up to 999A). Phases L1-L2 & L3. 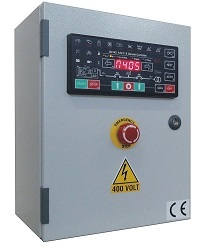 (60V up to 600V). Phases L1-L2 & L3. The Be28 shows alarms (table 4.10) and messages (table 4.20). The presence of an alarm is indicated by the blinking message [ ALAr.]. Push the [→F9] pushbuttons to display the alarm. Push the [←F8] push button to display additional information about alarm (section 8.0 of the user manual). MAINS Simulated. A programmable input simulates the presence of the Mains (see option  in the table 7.07). The measurement is not available. (*) Push [ACK-F10] to display the status of the count down of the timer.